Heat oven to 350°F. Spray 2-quart glass baking dish with cooking spray. 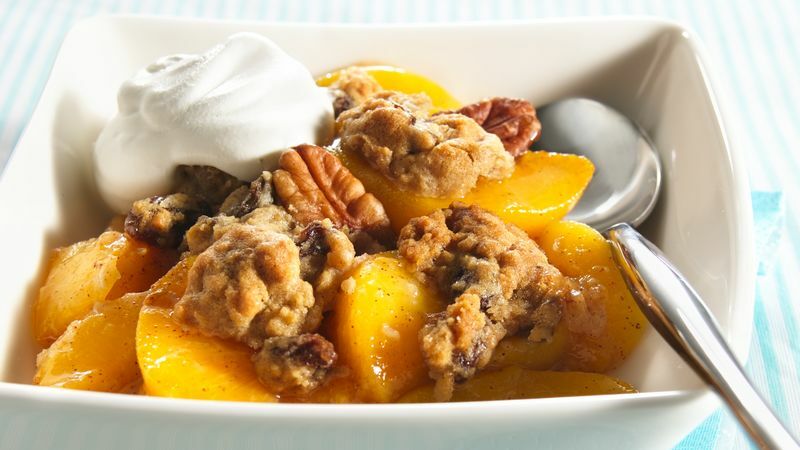 In large bowl, mix peaches, sugar, cornstarch and cinnamon; spoon into baking dish. Remove cookie dough from wrapper; crumble dough evenly over fruit mixture. Sprinkle pecans evenly over dough. Bake 30 to 35 minutes or until topping is golden brown, and juices are bubbly in center. Serve warm with whipped topping. You can substitute 1 1/2 cups fresh or frozen blueberries for 1 bag (1 1/2 cups) of peaches.